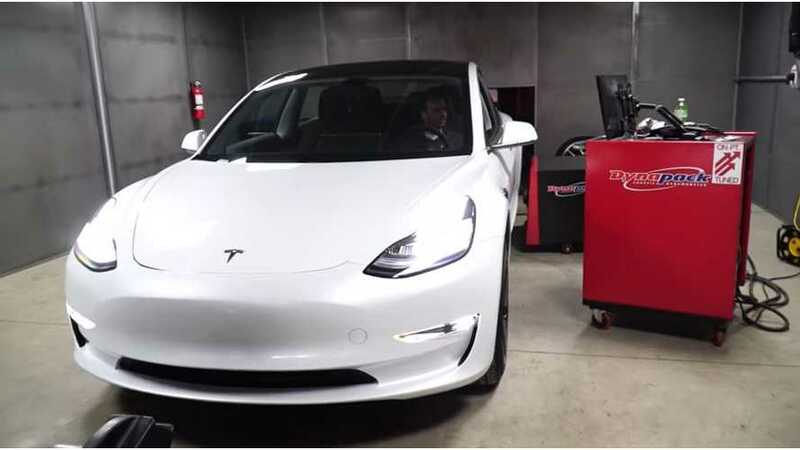 Mountain Pass Performance takes its brand-new Tesla Model 3 directly to the dyno. We've shared Sasha Anis' videos and stories before, as Mountain Pass Performance and On Point Dyno are friends of Inside EVs. Mountain Pass recently developed and tested some new aftermarket performance parts for the Tesla Model 3, including coilovers and suspension arms. Sasha admits that he and his team are very impressed with the car. As you can see, he has to play around a bit to "trick" the car's traction control. In the end, with an 80 percent charge, the Model 3 nets an impressive 340 horsepower at the wheels. Torque measurements came out about the same. In the coming days, he will be providing information about a number of other tests prior to fitting the new Model 3 with Mountain Pass upgrades. What an exciting day! We received our Long Range Model 3 today from the International Center in Toronto. We were lucky to be able to receive our car on the first day of mass deliveries – May 30th 2018. Needless to say the car is incredible. But we wanted some concrete evidence, so we threw it on the dyno not even one hour after picking up the car! After a bit of fussing around tricking the traction control system, the Model 3 with an 80% charge put down 340whp and about the same amount of torque. The X-Axis displays the motor RPM, and torque displayed is torque at the motor, not at the wheels. Stay tuned, in the next few days we will be posting videos as we perform more baseline measurements, data collection and tests on our new Model 3, followed by the installation of our Mountain Pass Performance coilovers, suspension arms and big brake upgrade!